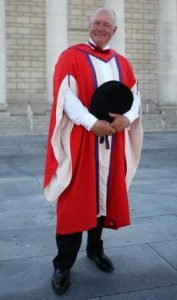 Secretary General of InterManager, Captain Kuba Szymanksi, has been awarded the honorary degree of Doctor of Maritime Studies by Solent University. In addition to his role at InterManager, Captain Szymanski sits on the Executive Board of The Nautical Institute, is a Director at TK Foundation, and a Director at Seafarers Rights’ International. Captain Kuba Szymanski started his sea career in 1985. He graduated from the Maritime University of Szczecin with a Master’s Degree and started his deck officer career with Dorchester Maritime Limited, Isle of Man. He sailed Gas I Chemical and Product tankers, reaching his first command as a Master in 1999. In 2001 he commenced shore assignment as a Marine Superintendent in the parent Dorchester Maritime Ltd IOM, and was promoted to Marine Manager, DPA in 2004. Captain Szymanski was among the very first Lloyd’s Academy students on the Ship Superintendency course in 2003-2004. Working his way up through ship management, he worked as General Manager for MOLTANK before joining InterManager as Secretary General in 2010. Captain Szymanski became involved with the University after witnessing the experiments being carried out at the Warsash Campus for the HORIZON project on seafarers’ fatigue. InterManager became a partner on the subsequent MARTHA project, and he was directly responsible for the dissemination of the findings to the shipping industry. He has also endorsed the recent Solent-led Effective Crew Project and Seafarers Mentoring Project. Kuba is a great educationalist and a firm believer in supporting young seafarers. He has provided funding to enable cadets to attend conferences and events in London and elsewhere. He is also a passionate believer in the value of research to bring about change in the shipping industry and a champion of the sector’s young career seekers.